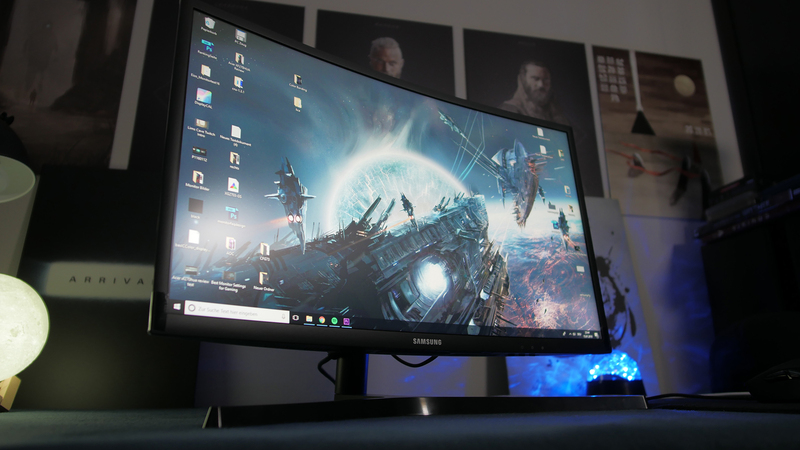 The Samsung CFG73 and the Samsung CF70 are two very popular gaming monitors. The CFG73 is simply the newer version with a revised foot stand and a software (Purple Artifact) fix. 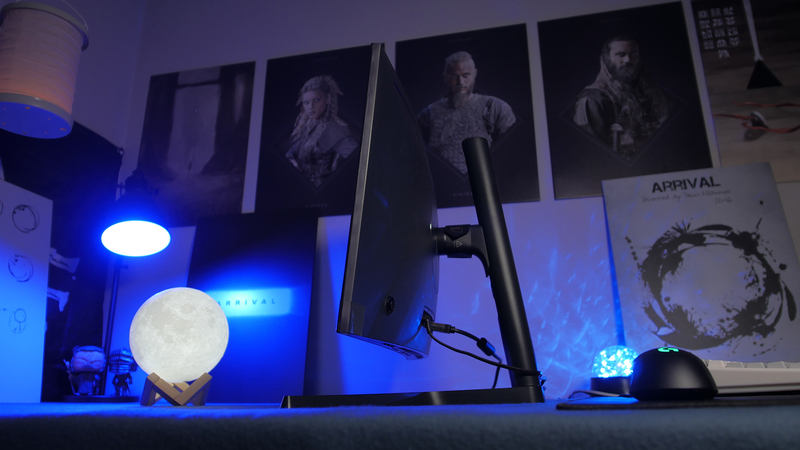 Both are 144Hz monitors with a response time of 1ms (MPRT - not GtG), a Full HD resolution, Freesync with a range of 70-144Hz and a curved Quantum Dot VA panel with solid blacks. This monitor, of course, doesn't offer an HDR (High-Dynamic-Range) feature. 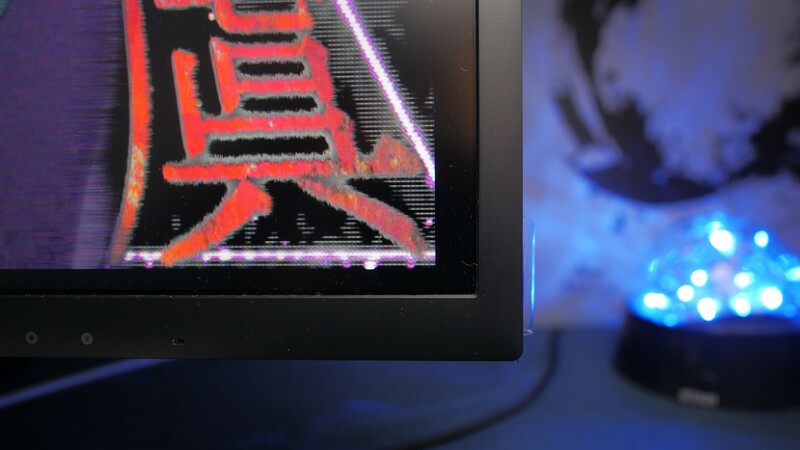 At my Samsung CFG73 Review, the purple artifacts where fixed and even my Samsung CFG70 doesn't have purple artifacts since the package was already opened. So I assume that I got a unit which was sent back from another customer, probably because of purple artifacts, and fixed by Samsung. 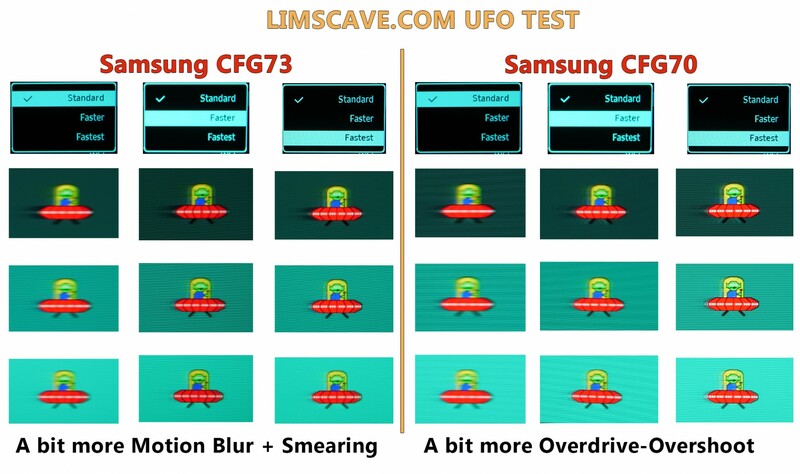 Strangely the Samsung CFG70 has less motion blur than the Samsung CFG73. Currently, the rating will vary between the YouTube video review and the written review. This is because in the written review two more topics (smearing and overall color impression) will be added soon. 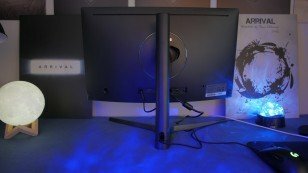 Is it the best gaming monitor for you? 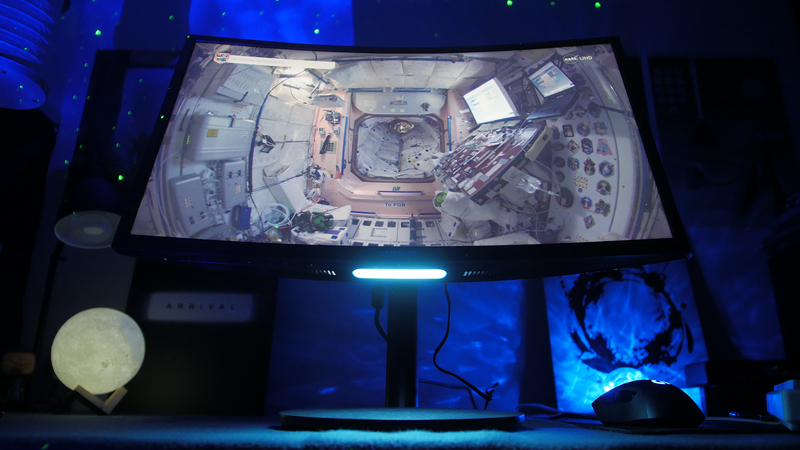 May you ask if its the best gaming monitor with a Full-HD resolution you can buy right now? It strongly depends on your personal needs. In my opinion, you should compare the disadvantages of another gaming monitor with 144Hz in another category, for example, the Viewsonic XG2401 which currently is the best gaming monitor in the Full HD high refresh rate Freesync "area" with a TN Panel. Only if you can live with a monitor's cons you can be satisfied with a gaming monitor for a longer time. However, if you are someone who is looking for a monitor for CS GO, Overwatch or PUBG, then I still would pick a TN panel. 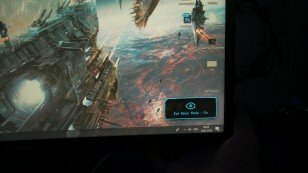 If you are someone who is playing mostly (single-player) games like Witcher 3 and especially Sci-Fi Games, then the CFG73 is probably something for you. 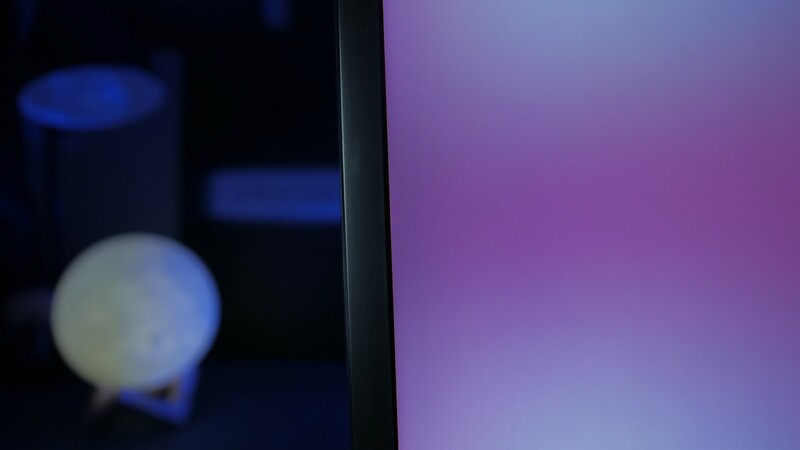 With its Quantum Dot colors, it has crazy intense colors, which does not look necessarily better than colors on a current 1440p 144Hz IPS panel - They simply look "different", sometimes better, sometimes wors. 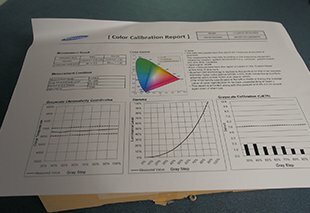 So how to describe the Samsungs CFG73 Quantum Dot colors? 1. 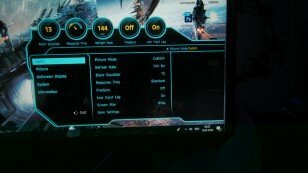 Current IPS panels from AU-Optronics which are used in 1440p 144Hz gaming monitors have a green tint, whereas the Samsung has a bit more reddish tint and a more transparency look. Btw, you can add this green tint to the Samsung CFG73 to reach an overall warmer color temperature. 2. Imagine a "red" color vs "neon reds", a "green" color vs "neon greens"... Overall colors are cooler but clearly visible more intense and saturated. 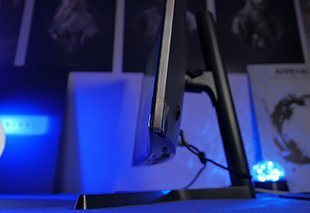 Samsungs foot stand is made out of plastic and feels a bit cheap compared to the overall monitor build quality. It is also very lightweight. The design is personal taste, the improvement against the CFG70s foot stand otherwise are very good. Ergonomics on the Samsung CFG73 are very good. The only one thing I'm missing as in most other monitors is a lower Min. height adjustment. On the back, we find a bluish circle with a glossy Samsung logo. 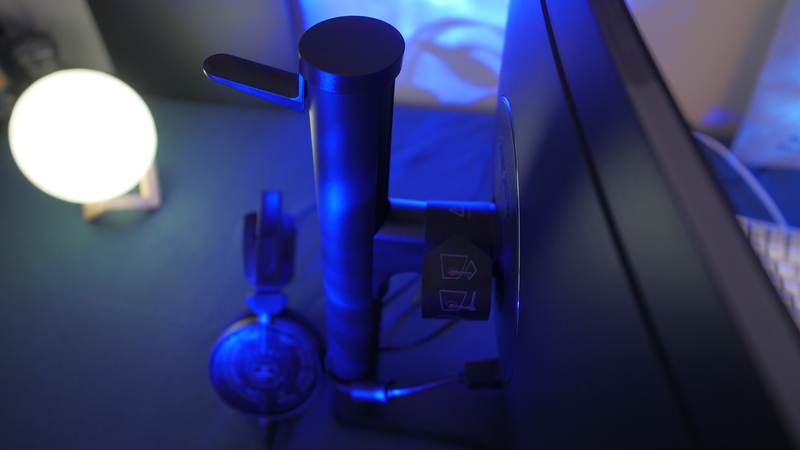 Everything is kept in a dark anthracite bluish matte plastic surface. On the top, we find a cooling slot. The Samsung's panel frame has a very nice design without any reflection issues on the inner panel frame. We also can wall mount the monitor (Vesa 100 x 100 mm). 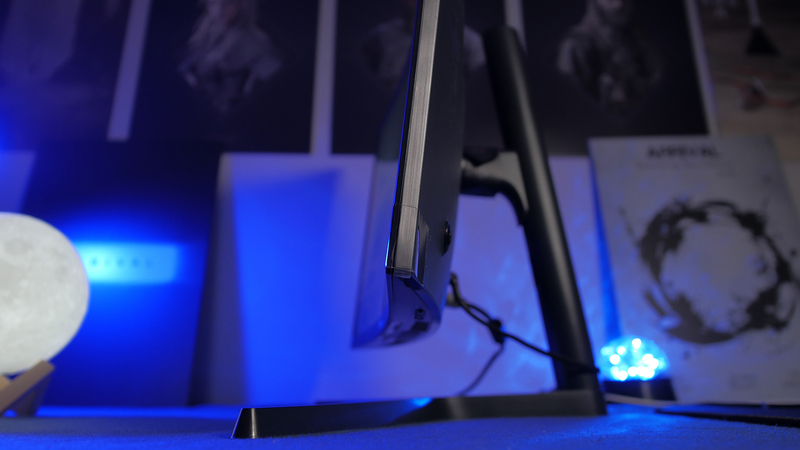 The monitor, except the foot stand, has a very nice and solid build quality. The used plastic does not feel cheap and everything is very well constructed. 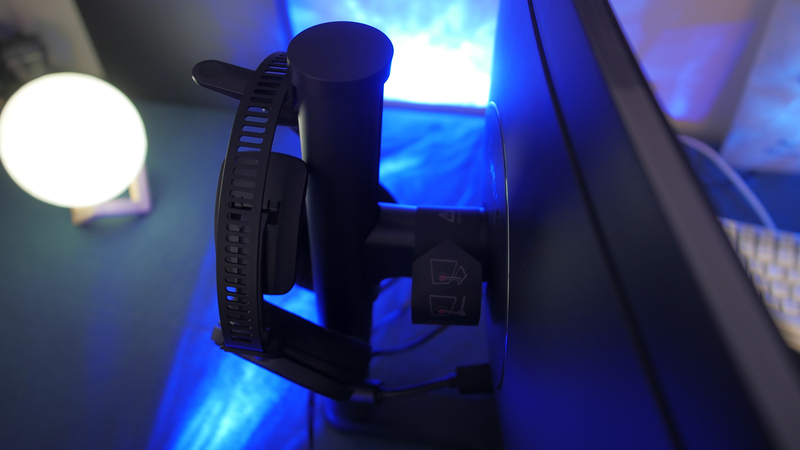 The only thing to complain about here is the lightweight foot stand made out of plastic and that adjustments are not as smooth as on other gaming monitors like the Asus MG248Q or the Viewsonic XG2401 for example. Only thing I'm missing is longer cables since these included cables are only 1.5 meters long. 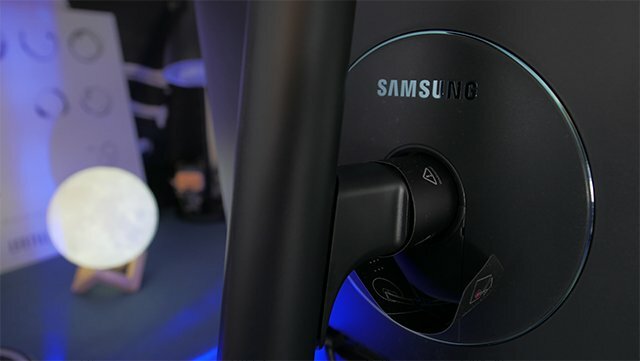 Samsungs offers a very good solution in terms of cable management. 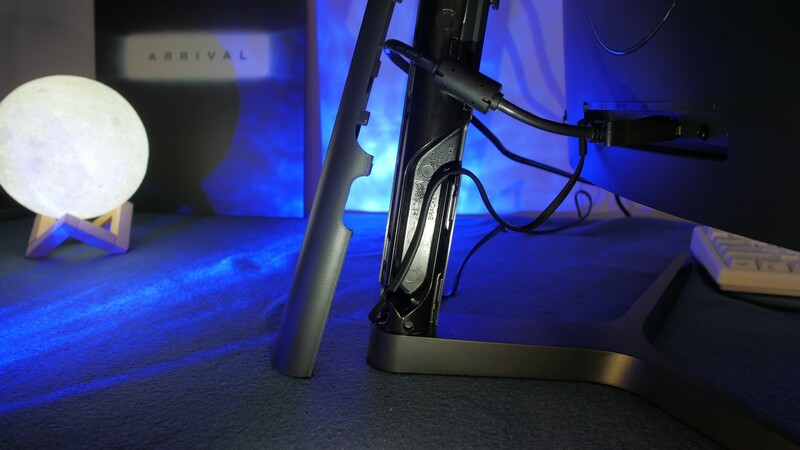 It has a clean look behind a cover integrated into the foot stand. It is just not that easy to remove this covering plate and you should be a bit careful not to break something in the covering which is made out of soft plastic. We find simply 1 Joystick on the right behind the monitor with which we can navigate through the whole OSD. Navigation is perfectly solved. Also added are three macro buttons on the lower right, where we can save and quick switch between our presets, something I'm missing in really many monitors. This, however, belongs to the topic response time. 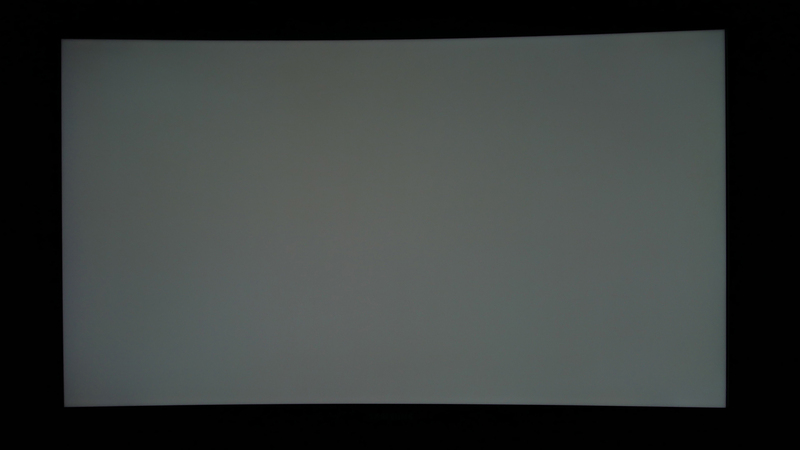 For a VA panel monitor, the Samsung has an average contrast ratio. 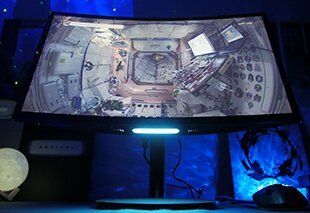 Compared to current TVs the contrast is not that good - but since we are comparing to other gaming monitors and we don't know how gaming monitors will improve over the next time, we still have a good contrast ratio on the Samsung CFG73. 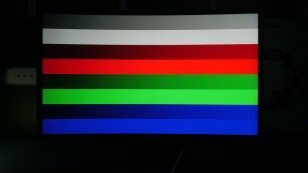 since this is not an hdr monitor with brightness control, the brightness will not change with respect to a larger white or color area. 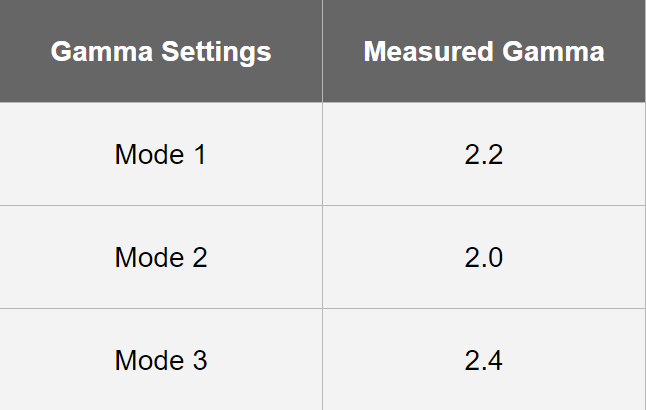 The Samsung has three different gamma setting. On "mode" we hit the perfect gamma curvature of gamma 2.2. Since the CFG73 also offers the Black Equalizer, you can easily change shadow details with this option. - Gamma 2.2 is not perfect for everyone. Some people also can prefer gamma 2.0 for example. - You also should not that Gamma 2.2 on a VA, an IPS, an OLED, as same as on a TN panel will look different. 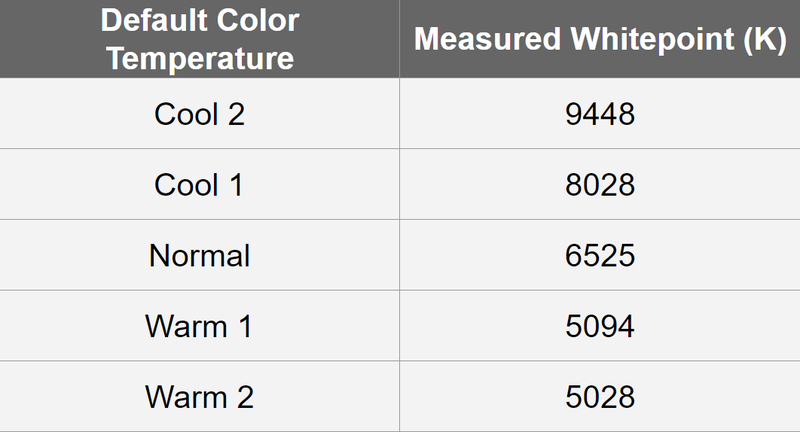 The Samsung CFG73 hits the near "perfect" 6500K on its native color temperature settings. 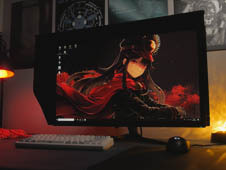 However, if you prefer a warmer color temperature as I do, you should consider that the Samsung CFG73 has a bit more red/orange tint compared to current WQHD 1440p gaming monitors. 6500K does not necessarily mean that this is the perfect result for you. 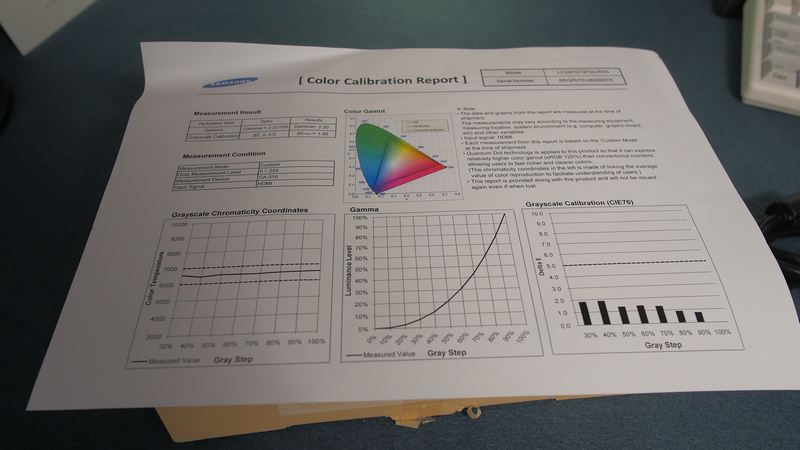 For print, the standard in color temperature, for example, is 5500k. 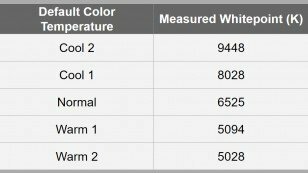 Personally, I prefer a color temperature around 5800k. If you want to see the closest picture to that how a game or a movie was edited in the post-production, 6500k is the closest setting. It also offers the cleanest whites. 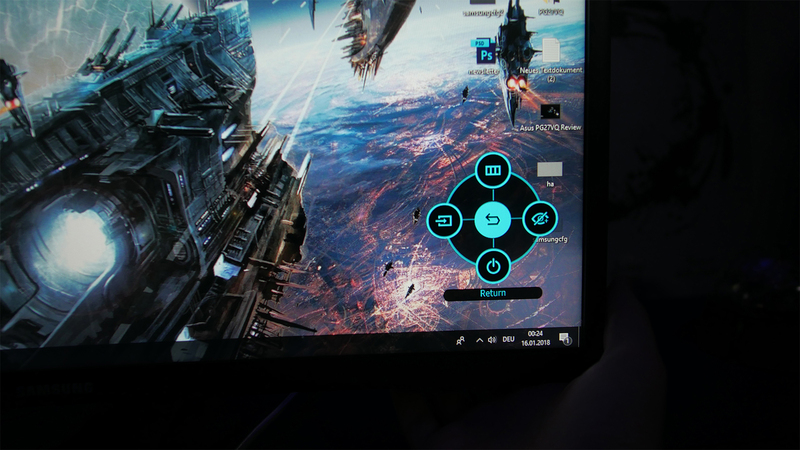 Samsungs's maximum deviation is 13% while around 15% is average on a gaming monitor. The result for gaming is very good whereas it is too much for a professional. 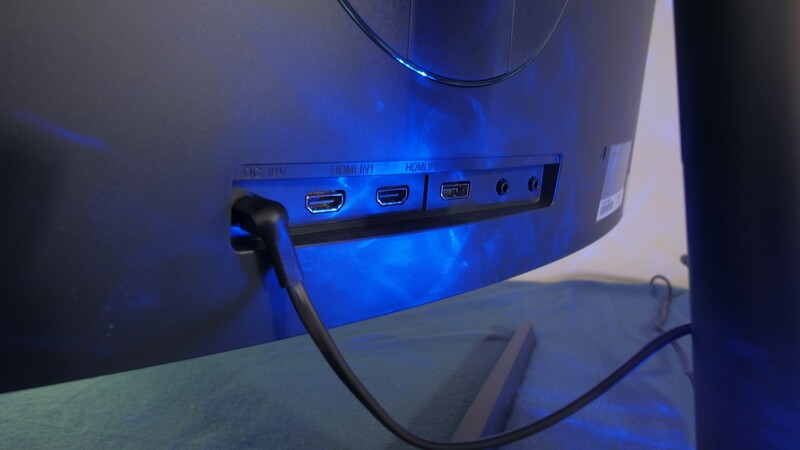 Here you should consider, those gaming monitors are not made for a perfect homogeneity. Within games, you wouldn't really see a difference. A maximum deviation of 2.5 in Delta E the white point homogeneity. For games a very acceptable result. When browsing the web, I was able to see a yellowish banding stip on the left. This means that a white color on the left has a much warmer color tone than in the center or even on the right. Strangely the measuring hardware didn't recognize this, while I can see clearly (!) with the naked eye. Measurements very close near to the panel frame are not included. With the naked eye otherwise, it is very clearly visible that the CFG Series has bigger issues with the homogeneity in this area. 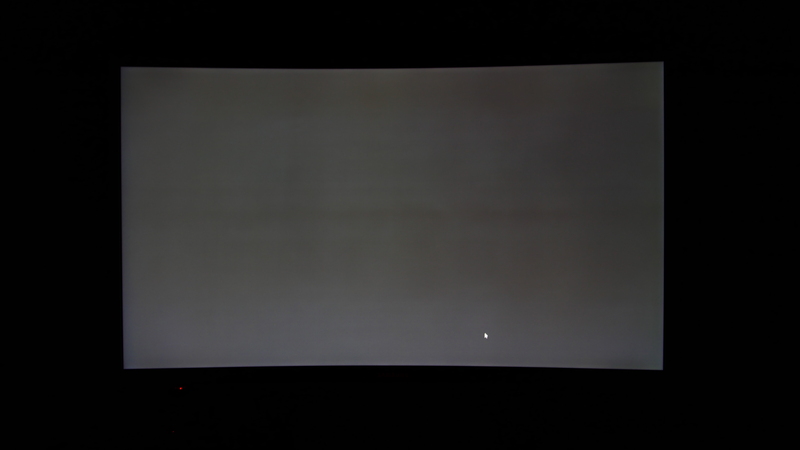 My CFG70, for example, has a much more visible yellowish "banding" tint on the left side. 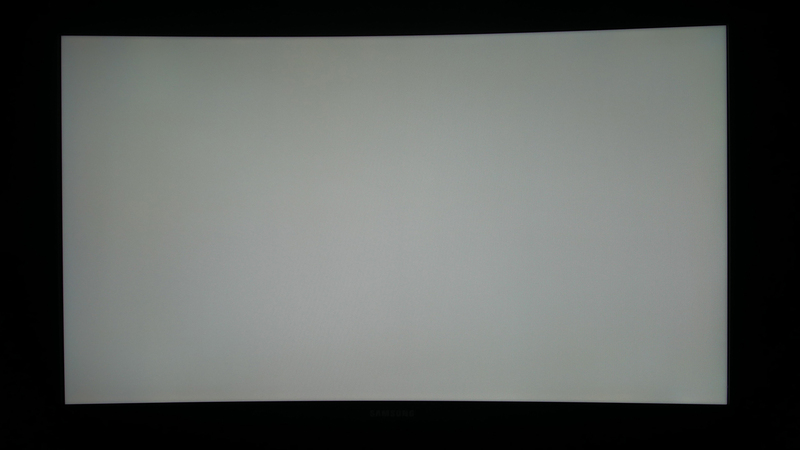 DSE is only a tiny bit visible and more of an issue at the 27" Inch version of the CFG73. In addition, on the 10% grey pattern, the VA Glow is very obvious. In terms of DSE (Dirty-Screen-Effect) which is important for panning shots, the Samsung in 24" is good. In terms of uniform colors, the CFG73 is bad. 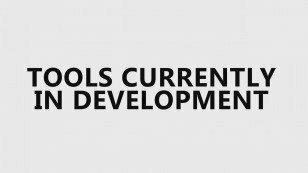 However, this is mostly only visible in brighter and uniform image content (especially in gray) and not a real issue for games. Viewing angles in bright image content strongly differ from viewing angles in dark image content. The VA Glow is also obvious in brighter image content which is the reason why colors on the CFG73 also can sometimes have a washed out look. All in all, viewing angles are good - even not as good as on projectors or some OLED displays. Note: we talk about Viewing Angles directly sitting in front of the display while moving the head a bit in every direction. Viewing angles on dark image content on the Samsung are poor. You have to find perfect height and tilt adjustments on your individual unit, otherwise, you will be able to observe much more VA Glow. Note: Correct height and tilt adjustments are very important for VA panels in dark image content, especially in a pitch black room. This can drastically change the perception of VA Glow. 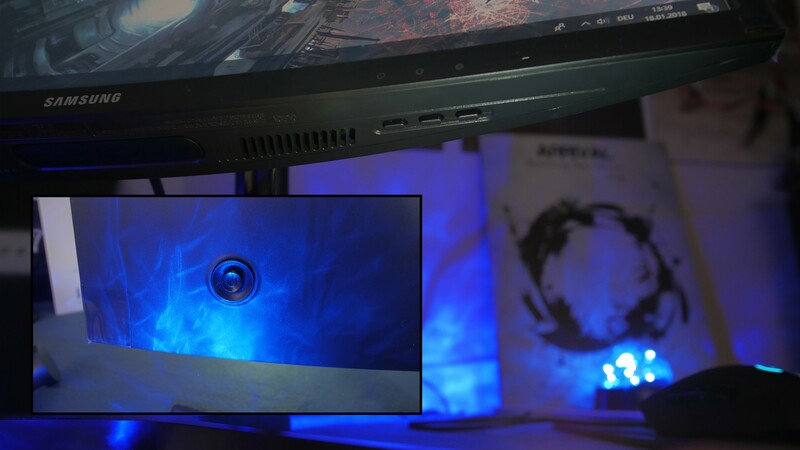 The further away, the more freedom you will have in viewing angles while gaming. 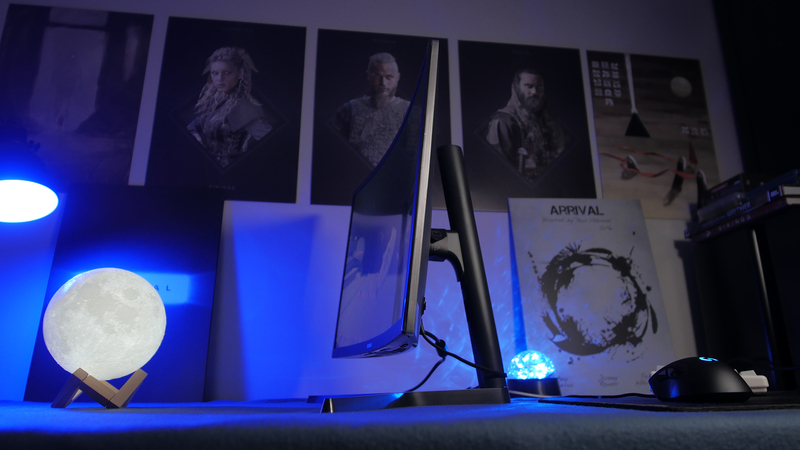 A half matte panel coating is used in this Quantum Dot gaming monitor. Unfortunately, reflections are disturbing more than usual because of the curve. The curve on this monitor takes up its reflections on the whole panel. 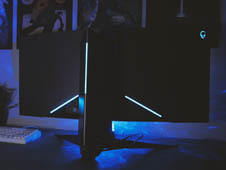 Personally, I would wish a glare panel so that the VA glow would be less visible, the image would be sharper, the subjective contrast enhanced and colors more pop. 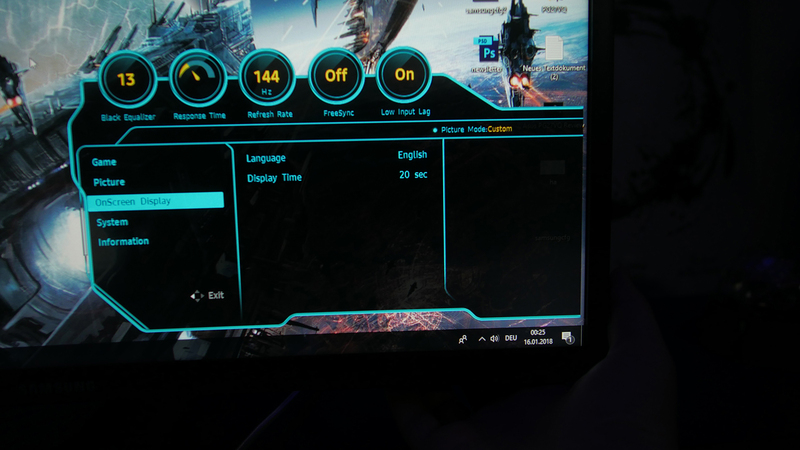 Compared to current 144hz 1440p gaming monitors Samsung coating is a tiny bit more matte. With a less aggressive matte panel coating, you have subjectively a better image quality (contrast, colors, sharpness) whereas a very aggressive matte panel coating is visible on bright & uniform image content in form of dirt or a glitter effect. Currently, I do not have any professionally good enough software. 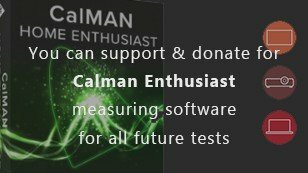 Since I hardly make any money with Lim's Cave, I depend on donations for this expensive software. 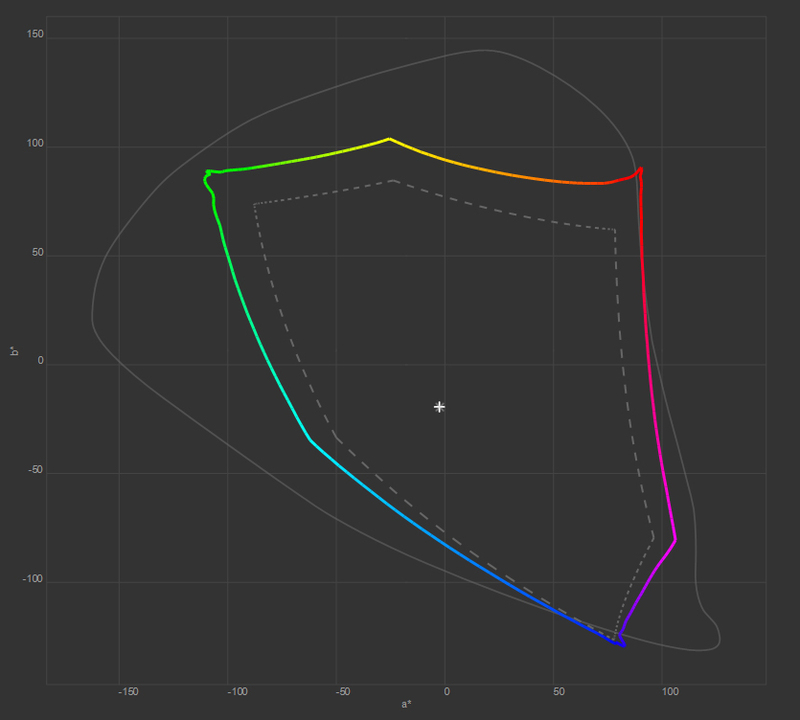 Note: The color gamut coverage is showing a coverage in a specific gamut (sRGB, Adobe RGB, DCI-P 3..). It's most important for those who need a full spectrum for image editing, post-production, and so on, depending on what they plan to "edit" or "produce" - whereas for games it isn't necessarily needed to fill a full spectrum of a specific gamut. The DCI-P3 gamut coverage for example otherwise is very good if you plan to watch movies in HDR (wide color gamut). The overall impression of Samsung CFG70's colors is very good. Compared to an IPS panel it's not necessarily better, it's just "different". Colors are very intense, pop, and vibrant. You should consider these Quantum Dots warmer red tint. 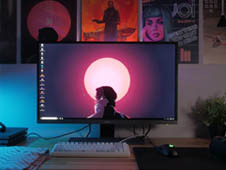 Sometimes colors or the overall color temperature can be too saturated in games with many reds and orange colors like Firewatch for example. 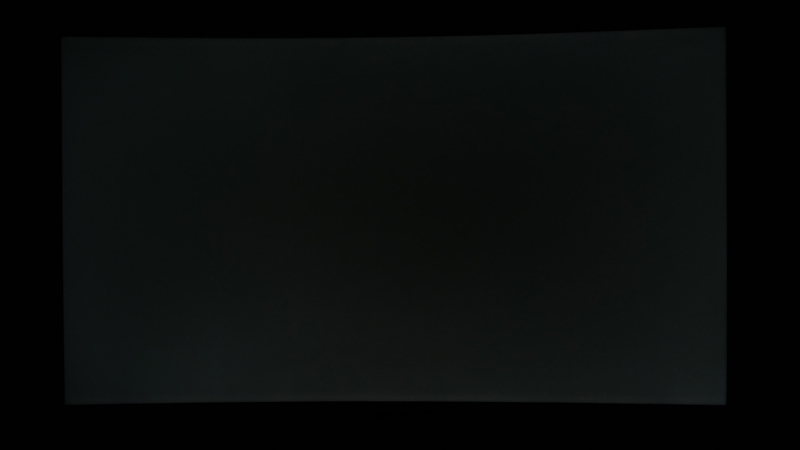 Skin tones also can be sometimes too saturated (reddish) compared to an IPS panel. Sometimes (depending on the image content) color also can look washed out because of the VA Glow. 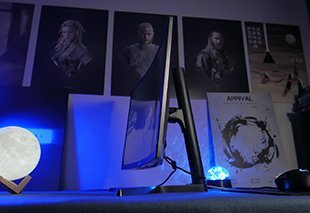 So how to describe colors of a Quantum Dot gaming monitor? "NEON" probably is the keyword. For Sci-Fi game genres the Samsung CFG and CHG series is perfect. The pixel structure will be added in future reviews while I'm currently saving money for a macro lens. Here we mostly already can observer color banding and harsh steps in the gradient. The Samsung handles color banding very good but not perfect. 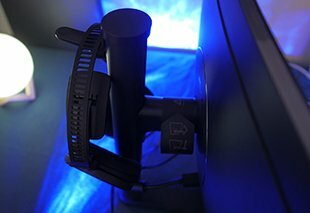 Color banding isn't an issue on this monitor (Gaming monitor typical) but still present as same as on "higher end" gaming monitors (1440p IPS). Note: Points are given without using the black equalizer, on gamma set to 2.2 and on 120 cd/m2. Even on compressed content, you will observe a bit color banding while on with the black equalizer and gamma 2.0 for example, you will observer pretty clear and much more noticeable color banding issues. Within color gradients, the AOC otherwise performs great, without any issues. Bezels are very stiff on the Samsung CHG73 and CHG70 but since this is a VA panel, it's much less important than on IPS panels. However, I think with less pressure against the panel (while the curve also adds some pressure) we would have fewer uniformity issues near the bezels. Note: The panel frame construction is VERY IMPORTANT on a display, especially within an IPS panel. 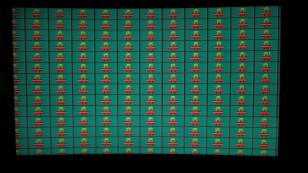 A well-constructed panel frame can drastically improve the IPS Glow quality and cause less Backlight Bleed issues. My CFG73 has more clouding than my CFG70. On the CFG73 on the left side, we can spot two clouding spots (on 120 cd/m2). Against current VA panels from other manufacturers (Acer, Lenovo, MSI...) The Samsung still is much superior, but far away from perfect. Important: The "amount" of clouding depends on your brightness settings. 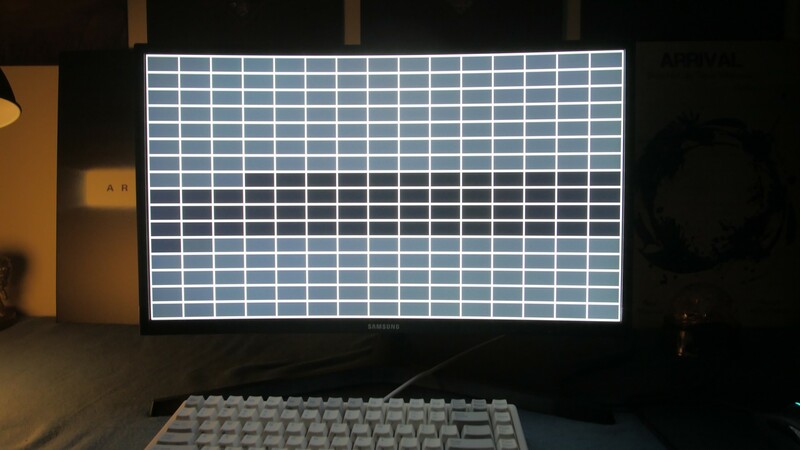 I've tested this monitor mostly on 120 cd/m2. For dark image content and movies, I wouldn't recommend using brighter settings than 150 cd/m2, especially because clouding then is more visible. 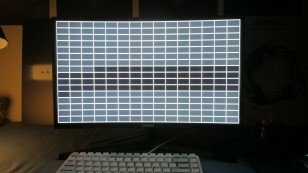 No "typical" backlight bleed issues on this monitor. Note: This can differentiate within each individual unit. You also can take a look at the gaming monitor list to check if there are ratings from other users available. 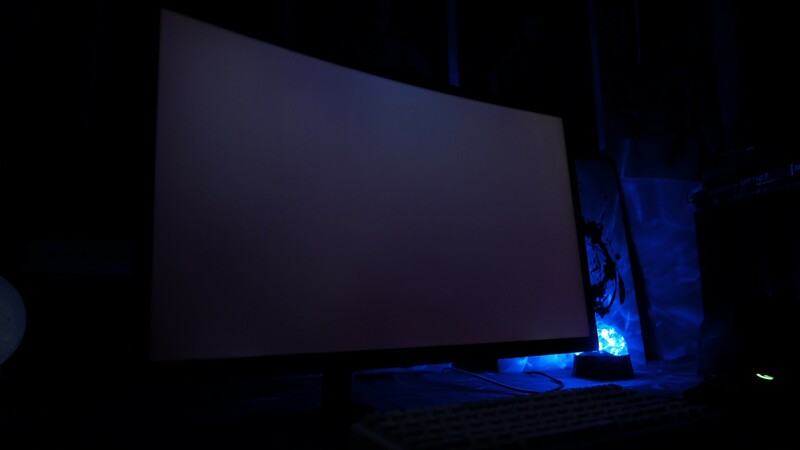 The VA Glow is very obvious and the biggest weakness of the Samsung CFG73. It is easily visible, especially in dark image content and darker colors. 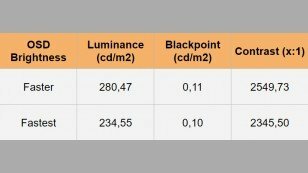 Compared to IPS, the Glow is also more visible in bright image content. However, the HP omen X35, for example, has more glow issues and the Samsung C32HG70 less. Note: The prescription of glow can differentiate within each individual person and even a little bit within each individual unit. You also can take a look at the gaming monitor list to check if there are ratings from other users available. The Samsung's refresh rate is perfect for those who want a high refresh rate monitor. Of course, there are already 240Hz or even 480Hz panels on the market, the difference in games between 144hz and 240hz still is slight. 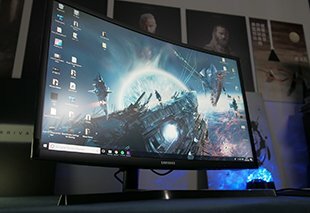 The difference from 144Hz to 165Hz is mostly just a gimmick. 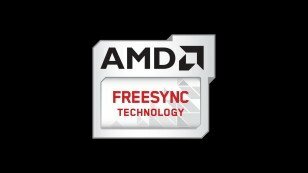 Freesync works without flickering issues in the CFG73. No frame skipping, no stuttering issues. 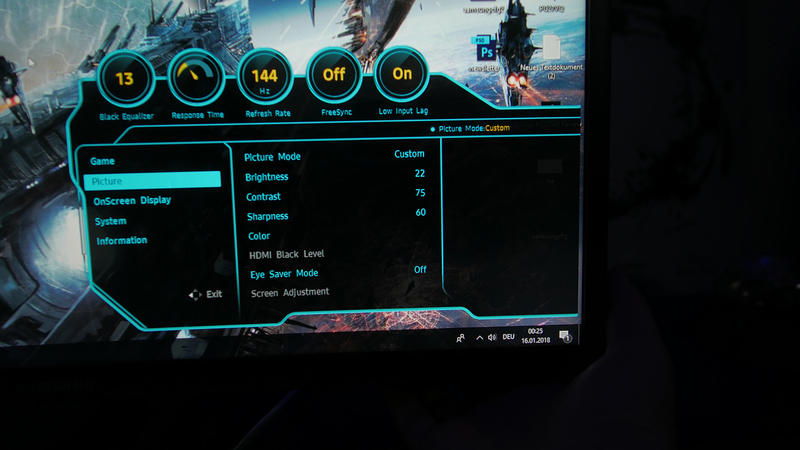 Unfortunately, the Freesync range is lower compared to current 144Hz 1080p TN gaming monitor models (48-144Hz). So depending on the games you play, it comes up to you if the Freesync range is enough for you. For a VA panel, the Samsung still is a good pc monitor. Unfortunately, Samsung isn't offering overdrive settings and I really would wish they would so, so they also could avoid purple artifact issues in the past. 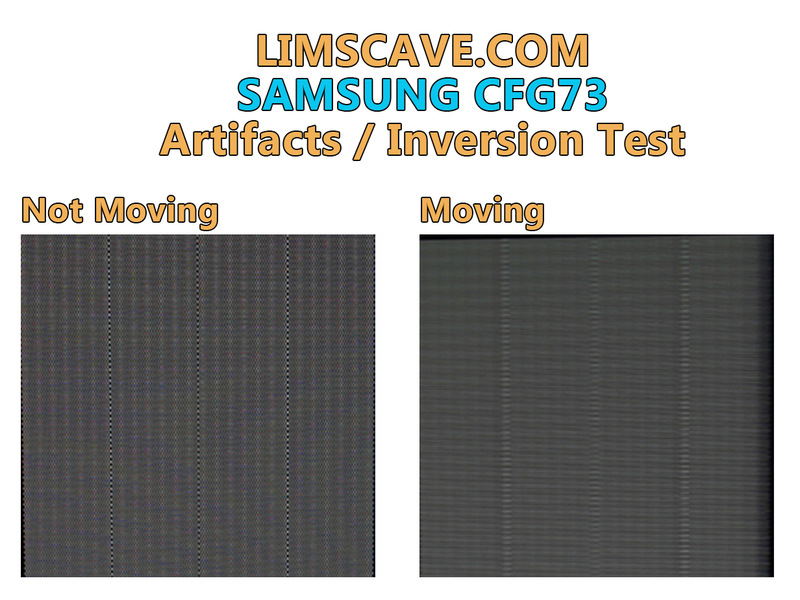 The Samsung CFG70 also has smearing (VA typical) and a worse pixel responsiveness compared to TN and IPS. 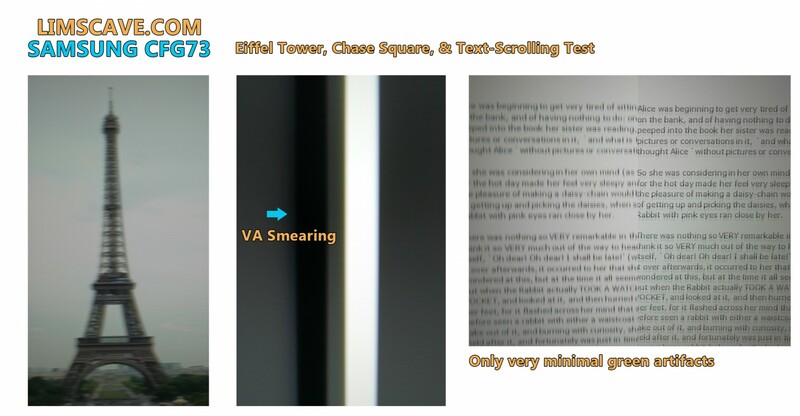 You can observe smearing even in the ufo test (the black outer lines from the ufo). The darker the background the more smearing you will observe on a VA panel at dark objects. I could notice some fine horizontal scan lines on the lower left. On BlurBusters test pattern there are like 0% artifacts, which is a very solid result. A 24p playback without judder only matters if you watch movies on your monitor. 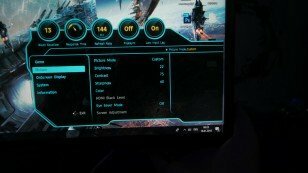 No frame skipping issues. This means you will not have trouble with stuttering. The Samsung also has only a tiny bit issues with green color temperature artifacts, mostly only visible at text scrolling. Samsungs backlight strobing feature, in general, is good. Before the purple fix, we could observer less strobe crosstalk, ghosting, and inverse ghosting. For me personally, after the fix, it now isn't something I would use in the Samsung. The CHG70, for example, does its job much better than the CFG70. 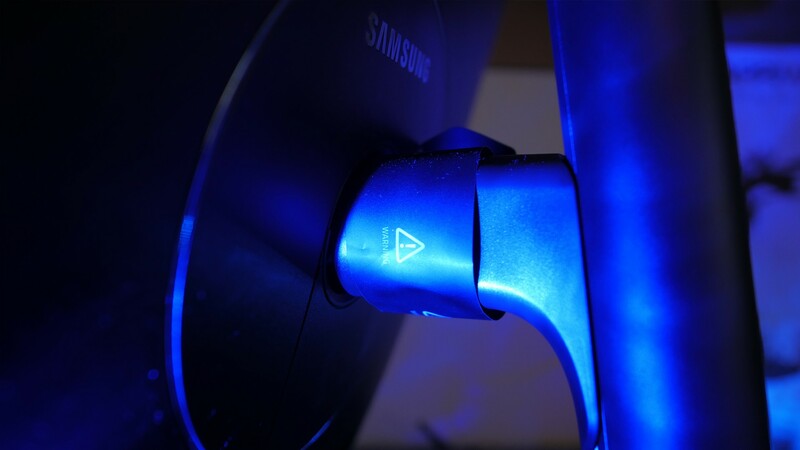 The Samsung offers a maximum brightness of 280 cd/m2 while on "Fast" and 234 cd/m2 on "Faster". Unfortunately, we cannot change the brightness when using the Motion Blur Reduction. In the end, it depends on your personal brightness settings so that I don't rate the brightness. For me personally, this is much too bright. Currently, I cannot measure the Input-Lag because I don't own specific Input-Lag hardware. 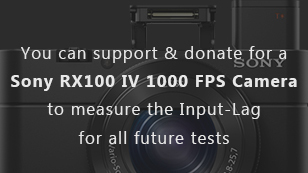 Since I hardly make any money with Lim's Cave, I depend on donations for this expensive camera. You can donate here. I'm thankful for any donations! As soon as the money is reached, I will produce a special thanks video, where each donation will be mentioned in the video. With Adaptive Sync (G-Sync): ?? We are currently only missing USB ports on the Samsung. The positioning of the connections is easy to reach. 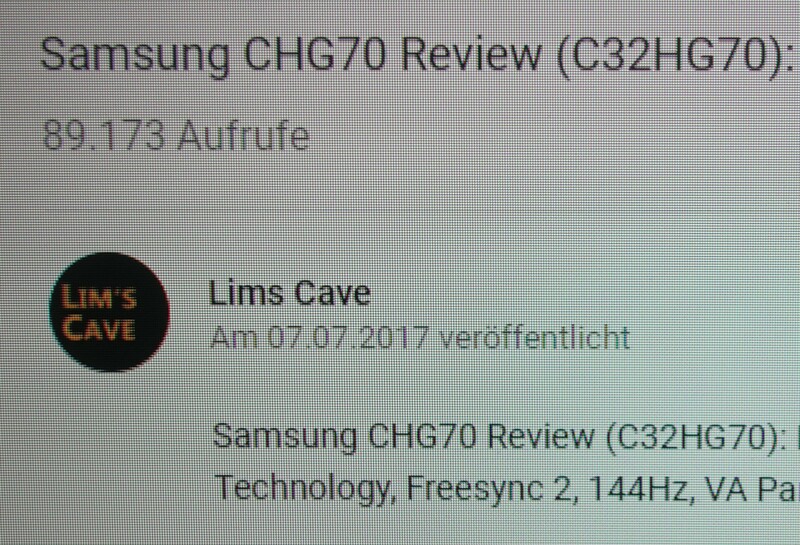 Here you can take a look at the Overall-Rating for each topic of the Samsung CFG73 Review. Note: In future, you also will be able to create & configure your individual rating for your individual needs. 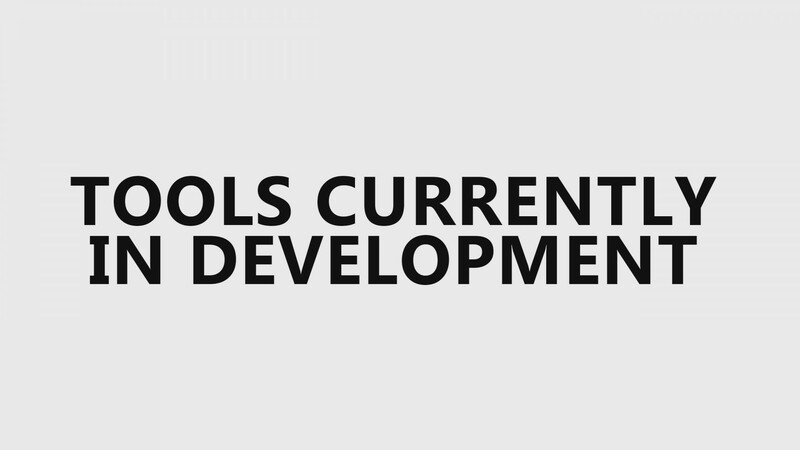 Here you will be able to distribute "100%" to each topic with an individual amount of percent. Example: The response time is very important for you? Then you can put 20% of your 100% to the topic "Motion Blur & Response Time". After distributing the whole 100% you will become a score and find which monitor from all reviewed monitors is best suited for your individual needs and preferences. 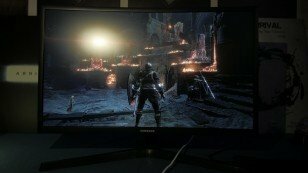 The Samsung CFG73 gaming monitor is a very good gaming monitor, especially for its price. You should consider, that the price can vary in each region. I've paid only 250€ for the CFG70 and 300€ for the CFG73. I don't think that it is worth to pay 50€ extra. The problem is that many CFG70 units without a firmware fix will still suffer from purple artifacts. 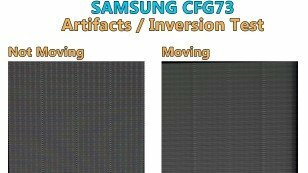 You may ask Samsung if they can fix your unit before you go with the CFG70, so you can save some money to invest in other hardware components. At least in Germany, they are offing a firmware fix for CFG70 units with purple artifacts. 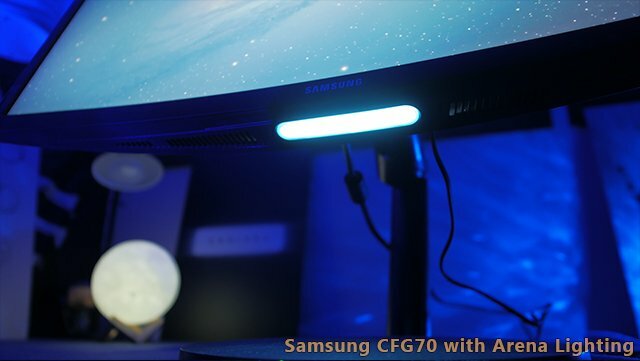 The Samsung CFG70s Arena Lighting which has been removed in the OSD of the Samsung CFG70. So in the end, the Samsung CFG series is currently probably the best choice when it comes to a 144Hz VA panel with Full HD. You may consider, that the uniformity and homogeneity, pixel responsiveness, clouding etc can differ within each individual unit, but since I had now 5 times the CFG70 series, I can tell you that all of them will suffer in text inversion and homogeneity issues near the bezels on the left and right. The "yellowish" banding strip on the left can also vary within each individual unit. What very important to consider is, that the 27" Inch version, no matter if it's from the CFG or the CHG series with 1440p can have much more issues with banding and DSE. You can find more of them in the Samsung CFG70 Review. The Samsung CFG70's backside with the baby-blue circle and Samsung Logo. I will keep the CFG70 because of less motion blur compared to the CFG73. In this case, I just had some luck that I got a unit which already had the firmware update installed. High-Resolution Sci-Fi or Space videos & games combined with these "neon" Quantum Dot colors really look awesome. Stellaris, Dead Space, Star Wars are suited for the CFG and CHG series. The biggest disadvantage for me personally (and I think also for the most people) is the VA glow. 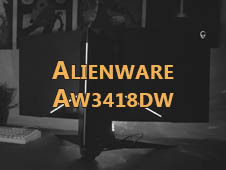 It gives the monitor the typical "VA look" with this shiny, gleaming, and glittering effect and especially in low contrast content where filters were used to highlight black details like in Vikings or the game No Mans Sky this monitor has its issues. The Glow is much more / mostly visible in very dark color tones (dark grey, dark green, dark blue...) than in blacks. 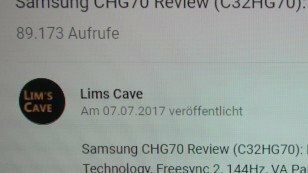 Want to support Lims Cave? You can do so while subscribing to my YouTube and my Social-Media Channels. 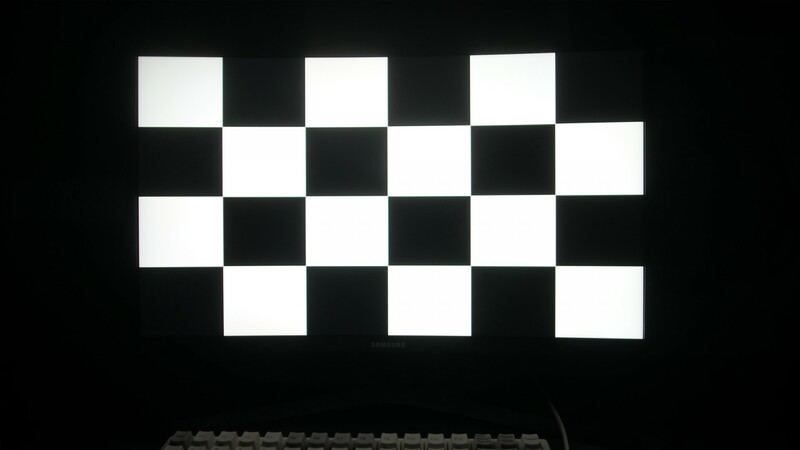 Even in brighter image content, the glow is easily visible, as we have seen in the Samsung CFG73 Review on YouTube. The middle screen area has more intense colors than everything around this "iris". This is why Viewing Angles in a monitor are very important. At the Samsung, you have to sit perfectly straight in front, and the more far away, the better and less visible the glow. People mostly think that they don't think need good Viewing Angles for the "perfect" image quality when just sitting in front, but this is not really the truth. 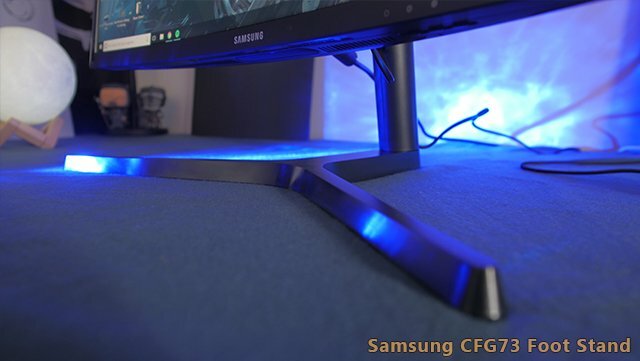 The new foot stand of the Samsung CFG73 is a good improvement to the older one from the Samsung CFG70. 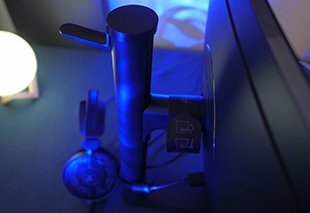 Use lamps in your room to increase the subjective black level and lower the perception of the VA Glow. Even small desk-lamps can help. 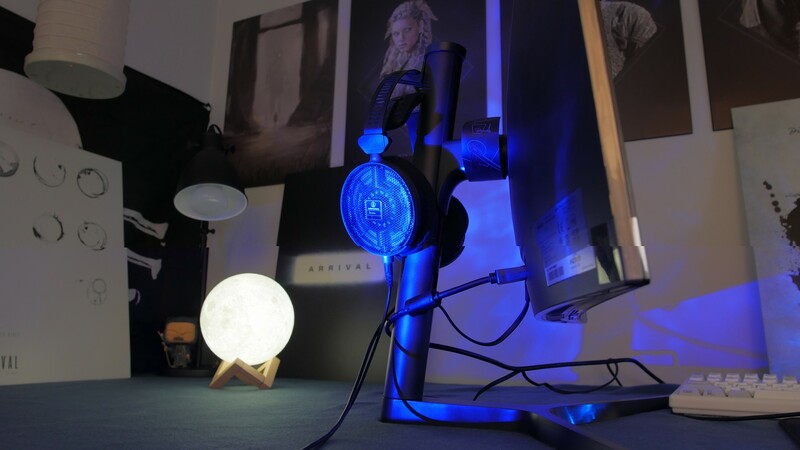 Check out the Atmospheric Gaming and Home Cinema Lamp Reviews on Lim's Cave. Try to sit at a perfect Viewing Angle, so you will have the best image quality, best colors and less VA Glow. Do not sit too close to the monitor, this will increase the VA Glow drastically. You also can increase the Black Equalizer in the OSD (for example to around 10), this also will help a bit to lower the VA Glow. Try to get used to a lower max. brightness. 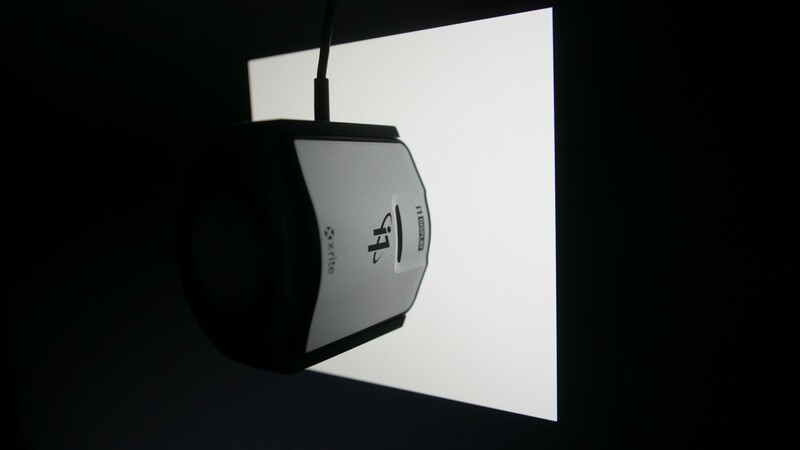 Many people are using their monitor in very extreme brightness settings. 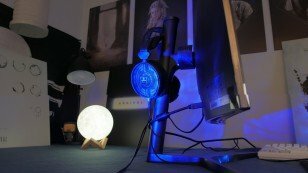 After you will get used to the lower brightness (around 1-2 days, depending on how long you sit at the gaming pc) you will have an overall better image quality and your eyes also will be thankful. can look better / worse than an IPS panel. and loss of saturation as possible. (Don't trust data sheets from manufacturers). 1). 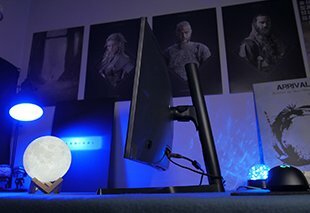 What is the optimal room lighting set up for gaming? 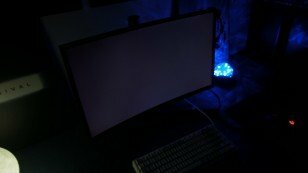 Gaming in the dark? Having a dim roof light on? 2). What is the optimal viewing angle? Top of monitor at eye level? Top of monitor at hair level? 3). How far back from the monitor should I sit? 4). How high would you recommend setting the black equalizer? 5). How low would you recommend setting the brightness settings? Also, how would I use the optimal OSD settings table? How do I know which column is relevant to me? Hey mate, sorry for the late response, I just miss it. 1) There is no optimum, in general, = the brighter the better while the contrast to your environment increased. Hello Lim, thanks for the in-depth review. Whats your preference for the reaction time/Reaktionszeit setting? 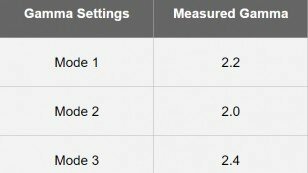 Is it worth changing to the fastest setting? After the fix, for me personally no longer (because of more ghosting/crosstalk issues). I would set it to standard (you cannot use Freesync with set to "faster" or "fastest"
Where's teh UFO test photo like in your other articles? I don't want to use a screenshot of your yourtube video. I bought it after watching the video and I was very pleased. but I did not pay attention to the fact that the field illumination was in an old version. why removed the field lighting? Under the monitor the lighting area is still available. Yes, it is really curious why they did remove the illumination in the OSD when the LED probably is still built in. I really do not know why. But otherwise, the LED only is disturbing while it can only "blink" or "breath" the whole time. We only could write Samsung a mail and ask them. Hi Lim. In those pictures of the CFG70 what % grey picture did you use? I took a picture of my C27FG70 at 5% grey and it looks far worse than your picture especially along the edges: https://i.imgur.com/VgcvSDZ.jpg. I’m wondering if I should return the monitor. Well the homogeneity on the edges does seem worse than most units and is visible on evenly colored backgrounds, however it isn't visible in the large majority of games. In some games (like Metal Gear Solid V) it is somewhat visible due to the raised black level in dark scenes, but it seems easy to get used to. Since the monitor is free from far more serious issues like purple ghosting and dead/bright pixels, I've decided to keep the monitor. I had a question for you. I'm considering this monitor (either the CFG70 or CFG73) for Gaming and for Photography editing. Do you think given some of the issues you've described, that it would be good for photo editing? 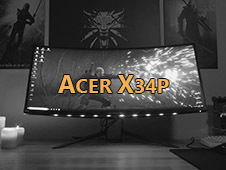 Or do you think that an IPS panel would be better (but then it begs the question of whether there are any good IPS panels within this price range that are good for gaming too - i.e have good response time, 144hz, etc.)? The other question I have is about the Black Equalizer. I have color calibration software and a monitor that has this feature (first time seeing it, until now with this samsung), but I'm not sure how this feature is supposed to be applied. Is it simply a matter of measuring a desired Black point and then leaving it alone? I do not really think that VA or even TN is "good" for photo editing. For photo editing viewing angles are pretty important (because of no gamma / color shift). 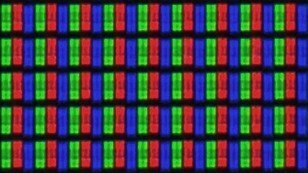 However, you can set the Samsung to sRGB mode but you still will have different colors/blacks/gamma in the center than in the rest of the screen. It is possible but not perfect. Very nice review. I just have a few questions. Here you have mentioned the response time to be &quot;1 ms mprt not grey to grey&quot;. 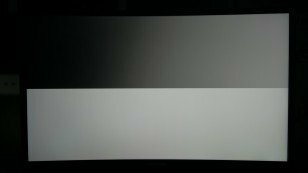 What is the difference between 1 ms moving picture response time and 1ms grey to grey response? Please explain. Also, when the response time is set to fastest, is their flickering perceived by the human eye? Or is it only noticeable when viewed with a camera? Can You tell me yours RGB settings? Did you change something there or it's default? Also, what's your picture mode? 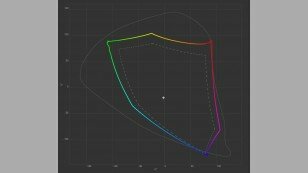 Is it true that sRGB gives you best quality? RGB settings are mentioned in the review, BUT: You cannot simply use my settings because EACH unit has a different native color temperature. You should try to find your preferred settings, and that is literally all. Your reviews are awesome and helped me alot with my decisions . I have a question regarding something that not many reviewers have talked about but is present in some panels. Im talking about the spacing between pixels. 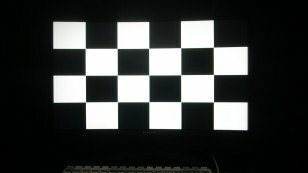 I just got myself the 27 inch HG70 and the distance between pixels is so large on a vertical plane compared to horizontal, that they create dark horizontal lines between them . 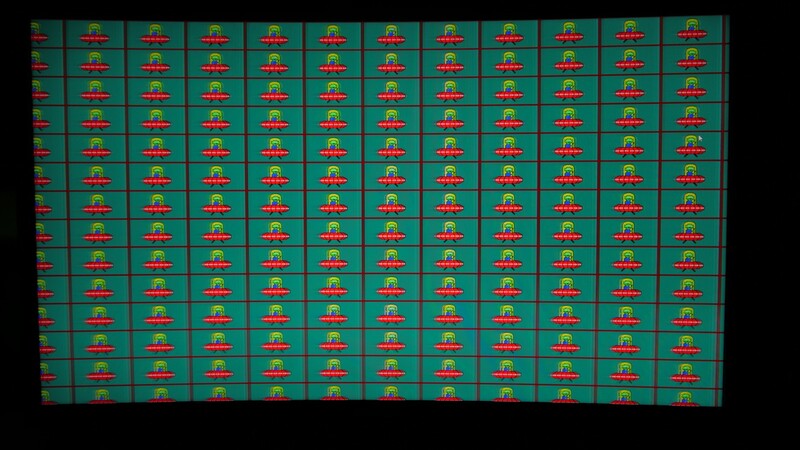 This effect is similar on old arcade systems except much less obvious and only happends on light and dim colors like a light blue/ grey /brown/yellow. The most obvious example is the desktop background picture in windows 10. Because of this issue, aliasing is increased in games and it feels like i have a much sharper image on my old TN Samsung S23A750D, no matter the viewing distance. Also anything non-native looks very blurry . Overall the image is not sharp at all . My question is, does the 1080P FG73 suffer from the same uneven pixel spacing? This can also be the main issue for bad text . This is a well-known downside on these Samsung panels and you have to decide if you can get used to for yourself. Hey Lim! First of all I am so gratefull to have found your site and youtube, you are a fantastic reviewer. 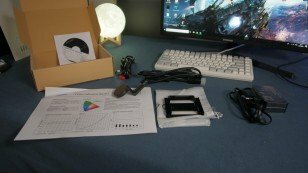 I am very interested in getting this monitor but I have some issues and I was looking for some insight. 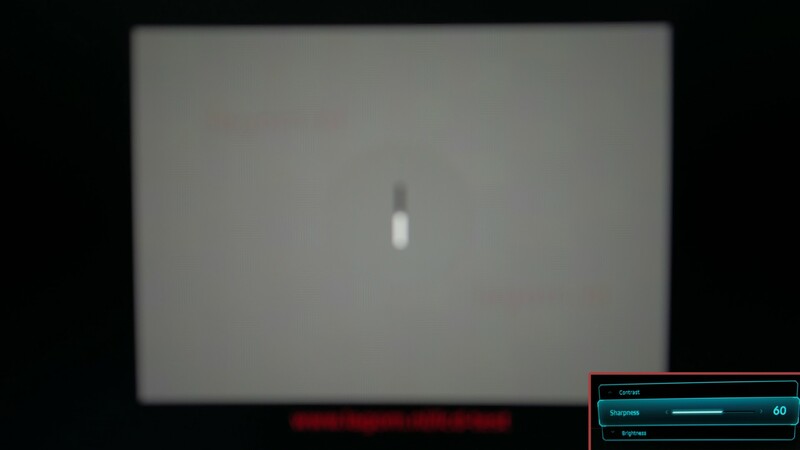 I have the Asus VX238H and I really dislike it for my daily pc usage, the colors aren't anything extraordinary (except while gaming with PS4/Switch) but what bothers me the most is this little grid-like effect that shows up whenever I scroll or there is some sort of motion, i can see like every pixel, it's so hard for me to explain what exactly is. 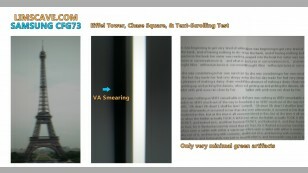 I have tested the VG248QE and I like the speed of it except I also find the colors kind of average, very washed out. Would not be my first option. 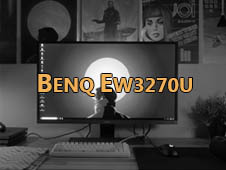 I am struggling a lot to find the perfect balance of speed and &quot;image quality&quot; considering I do a lot of reading, writing and programming, but I admit I am an extremely picky person and that I need to compromise one or the other when it comes to purchasing a monitor. 2) What do you mean by text inversion? 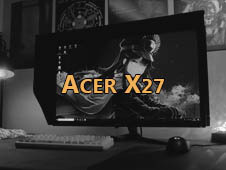 3) What are your thoughts on AOC G2590PX ? I was actually considering it. The "grid" effect you are talking about are vertical scanlines in moving objects. Each unit will differ in terms of this "issue". 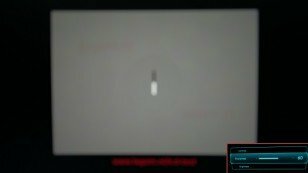 Mostly visible on 144Hz monitors. For some reason, the older models suffer more from this than newer models. For reading, writing and programming the Samsung tbh is not the perfect choice because of 2 reasons. Text-Inversion (unsharp, buggy text) and the higher contrast (lower contrast is mostly better for reading - for your eyes). 1) The curve is only slightly visible, but I personally like it. Im looking to buy the CF391 or CF397 because they are 32inch semi glossy. How is the coating on both cfg73 and cfg70 ? similar to the cf391?? I have another question. i want to buy a new monitor for my ps4 pro. I cant decide between 4k or 1080p. I read that is best to use the ps4 pro at 1080p with the supersampling and frame rate boost instead of 4k 30hz. I would really like to have hdr but not so many games support it . Right now i have the Dell s2418NX (Ips, 1080p, Almost glossy low haze coating, 60hz). I want to get a bigger monitor for better immersion. 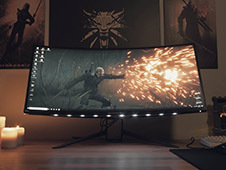 I am leaning to the samsung c32f391/397 i prefer glossy display and 32 inch seems the sweet spot( i know i would see the pixels thats why i am also thinking in a 4k display). These samsung cfg70/73 seems to be pretty good. the only problem i find is the size 27 inch. i also got interested in the new chg but there 1440p resolution dont get very well with ps4. Conclusion. any recommendation for the best display for ps4 pro would be great. The CFG70/73 is not really needed since the PS4Pro is capped to 60Hz - so a 60Hz panel already is good enough and I doubt that you will find something much better than your s2418NX (just the contrast on the Dell is poor). If you want 4k, then I would go with IPS (without HDR) since colors and viewing angles (which are very important within a monitor) are just better for now. 1- For FPS gaming (not pro but 95% of my time at PC) would you take the 24&quot;CFG73 or the 27&quot;CFG70 (not 24&quot; 'cause it's around 400€ here)? 2- Would you recommend me another monitor for that price? I use photoshop sometimes for my travel photos and i'm afraid of the bad TN panels around 250-300€ (E.S. Zowie/AOC/MSI), i'm not a designer but i have to tweak my photos sometimes. 2) Viewsonic XG2703-GS is a good one for example which I would recommend (depending on the price in your region). For photos, TN and VA both are not really good (depending on witch which color space you want to work with - The Samsung offers a sRGB mode, I am not sure yet how much of the Adobe RGB color space is covered in this mode). 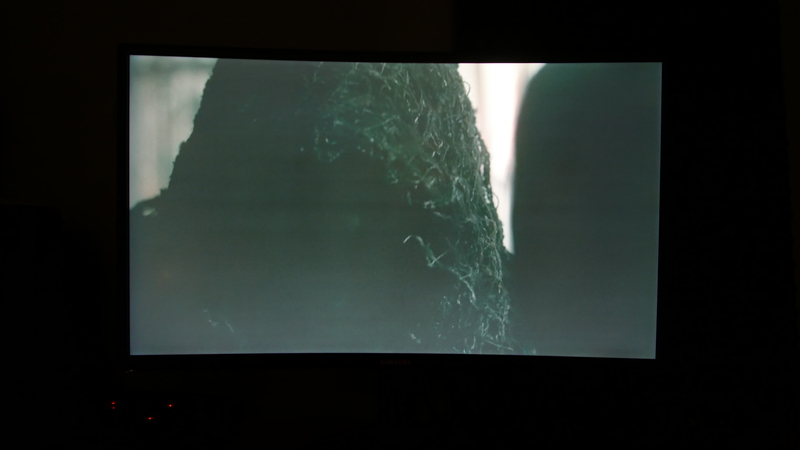 For photo editing (as well as video) IPS is always the best because TN and VA have gamma/color shift in viewing angles - and those are really important within monitors due to the harsher viewing angles and the distance to a monitor (compared to a TV for example). Someone with the Samsung monitor who's having a problem. It was purchased on November 23rd on black friday! 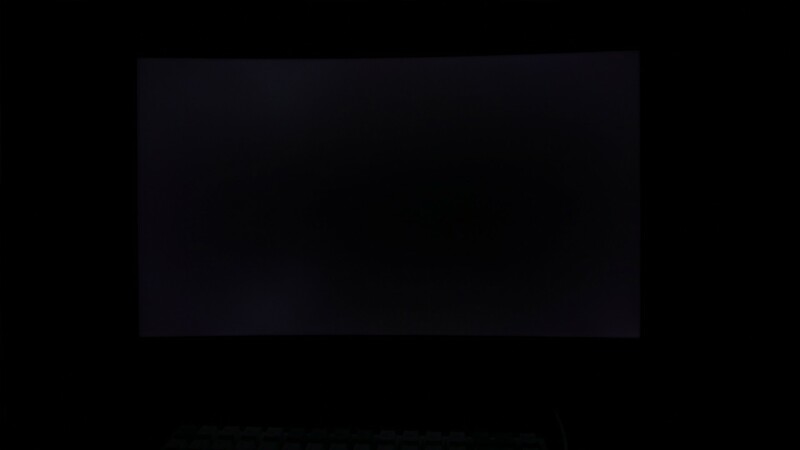 When I turn off the PC, I always leave the monitor in standby mode blinking, however when I call it the next day, I never see the image, always having to take it off and put it back on and it starts giving. This has to be with some problem, will it be from the display port? hello, indeed the freesync nvidia maj went out yesterday ... Has anyone tested now :)? I didnt tested it yet. My Nvidia card is broken and I will get soon a new one (probably the RTX 2080). Hello Lims, thanks for the review. I'd like you to give me an opinion. Sorry about my weak English. 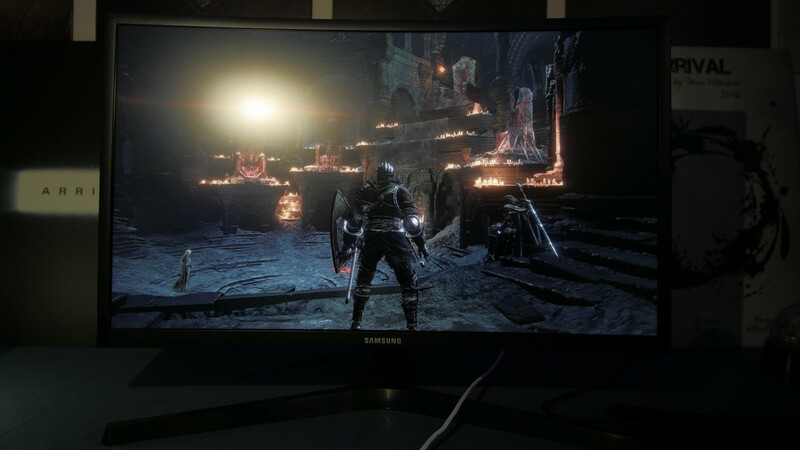 I have an Xbox One S and play on a Samsung TV 32&quot; 720p but do not like the image quality of it, in recent times I have been thinking of buying a monitor with good colors and quality of images, and that is not too expensive and found this Samsung cfg73. I play, for example, Red Dead Redemption 2 and Far Cry 5. 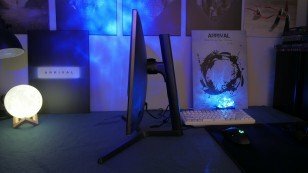 I do not know if it is worth buying the monitor, I would like you to give me an opinion, if I should or do not buy this monitor, if I buy it will be satisfied? I appreciate it if you can answer me, and again I'm sorry for my bad English. Hey. First of all, you do not really need a 144Hz panel for consoles while they don't support everything past 60fps/Hz. The pros of the Samsung is, it has the Quantum dot panel, while those cheaper 60Hz panels don't have Quantum Dots.